I've never been so happy to see slimy white grubs in my life. Apparently we entirely missed seeing not only eggs, but larva last week, as it appeared there was hatched brood cells already. We had one frame of capped brood, as seen below. We can tell this is brood vs honey, because honey has a white wax cap over the top, and brood cells are capped with this darker opaque wax. 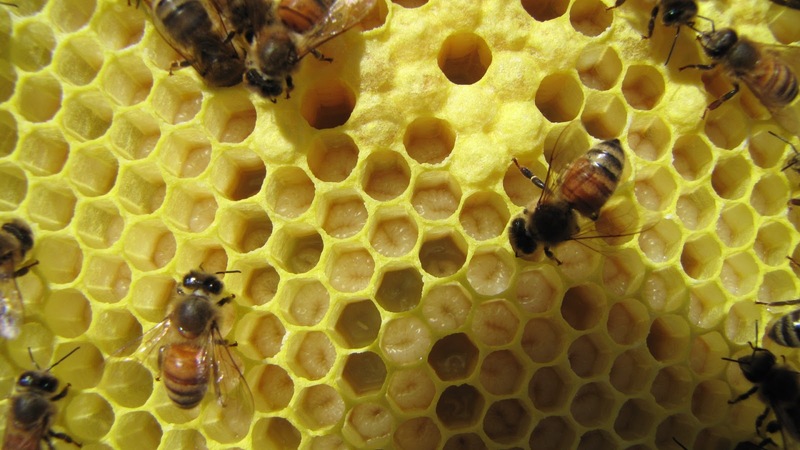 The single uncapped cells scattered throughout are where bees have already hatched. The nursery bees can be seen with their heads sticking down into the cells, cleaning out the old pupae's cocoon by adding it into the cell wall with another layer of wax. This helps improve the structural integrity of the comb when it gets hot and also acts as insulation (yes, I can cite the study). Capped brood cells with open spaces where bees have hatched. 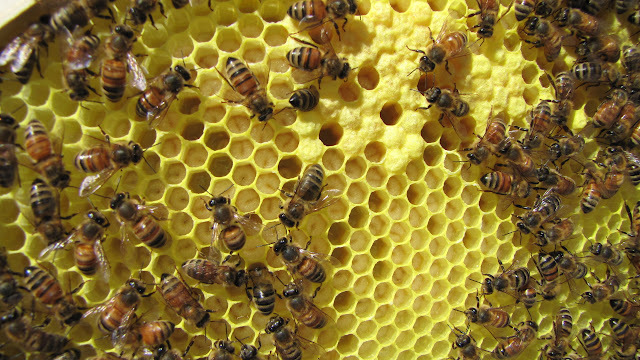 ﻿Along with the frame of capped brood, we also have several other frames with mostly larvae. Need a closer look? I have no idea how in Hades we missed seeing this last week. They're huge! Beautiful, slimy white grubs. We were even able to spot a lot of the eggs. Larvae!!! There are eggs in the cells center-bottom, they look like little grains of rice. ﻿It appears our queen is a good layer, because she has a consistent, solid laying pattern, and she's already gone back and layed eggs in the hatched cells. It pretty much looks like she's laying eggs in whatever comb is ready for her. 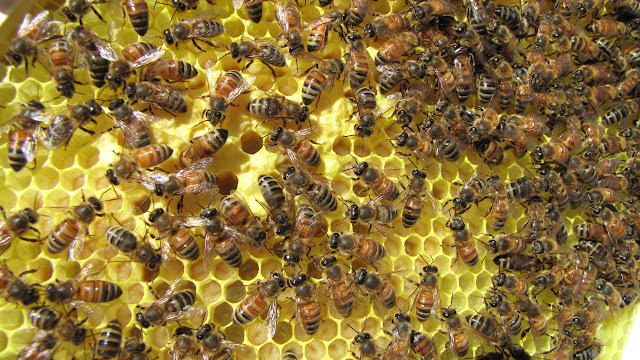 This is good, hopefully the hive population will start building up quickly. Another frame of larvae and capped brood. ﻿Now the worker bees just need to learn how to build comb better and faster. Just kidding! Bees instinctively know how to build comb, they just want to put it where THEY want it, not necessarily where I, the beekeeper, want them to. Like between frames 3 and 4. We left a little too much space there the 1st week, and they've got this crazy "double layer" comb built. We didn't want to remove it yet, because we can still get the frame in and out, and it had eggs in most of the cells. 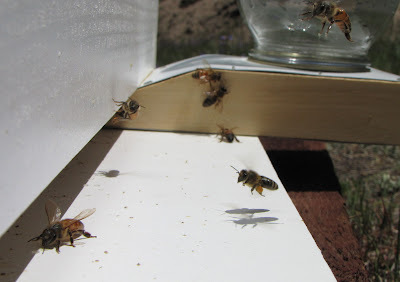 However, they started to build comb across the tops of the frames, sticking them together. I had to break the comb to separate the frames. I scaped this burr comb off, even though it was just a little bit. Frame 3 with the hanging "double comb." Two bees in center-left are putting pollen (bee on left) and nectar into cells to make bee bread. 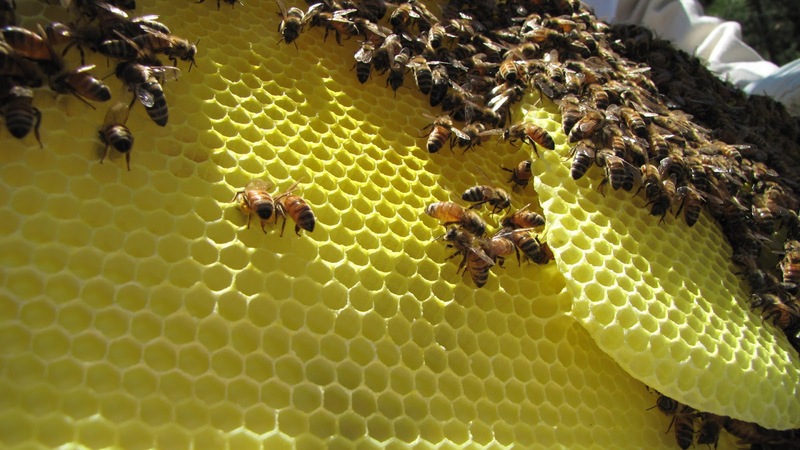 1) If possible, have frames with comb already drawn out for queen to start laying ASAP. 2) Nothing to compare it to, but maybe our bees don't like the plasticell foundation and are slow to draw it out. Something to consider. 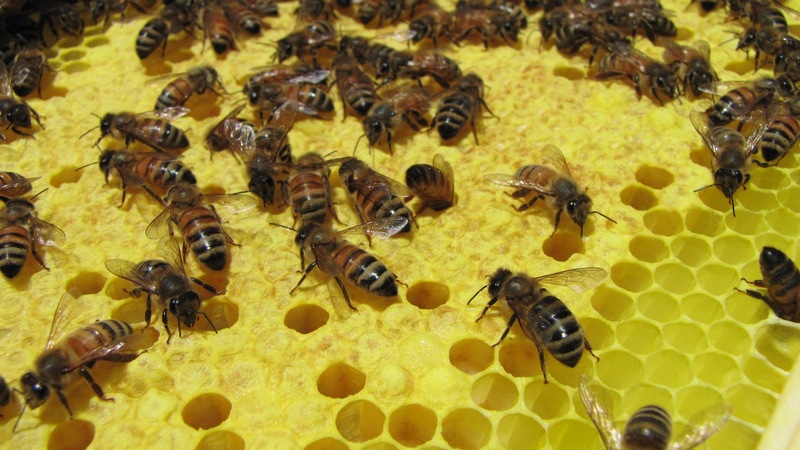 4) Beekeeping is a team sport. It takes Sarah and I to smoke and go through the frames, while her boyfriend Jason acts as photographer and notetaker (Thanks Jason!). Maybe with more experience we could handle it singly, but right now the extra hands are appreciated. 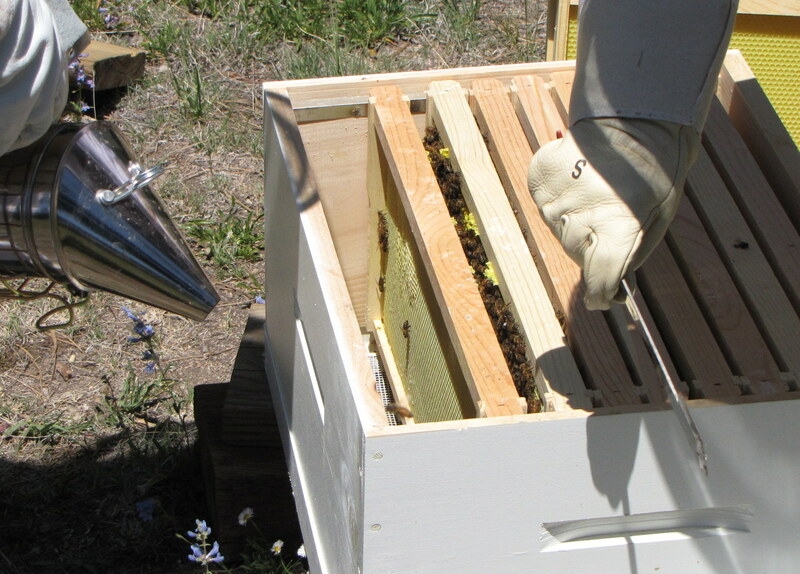 5) I'm really enjoying being a beekeeper. Bees coming in from foraging, one carrying pollen.